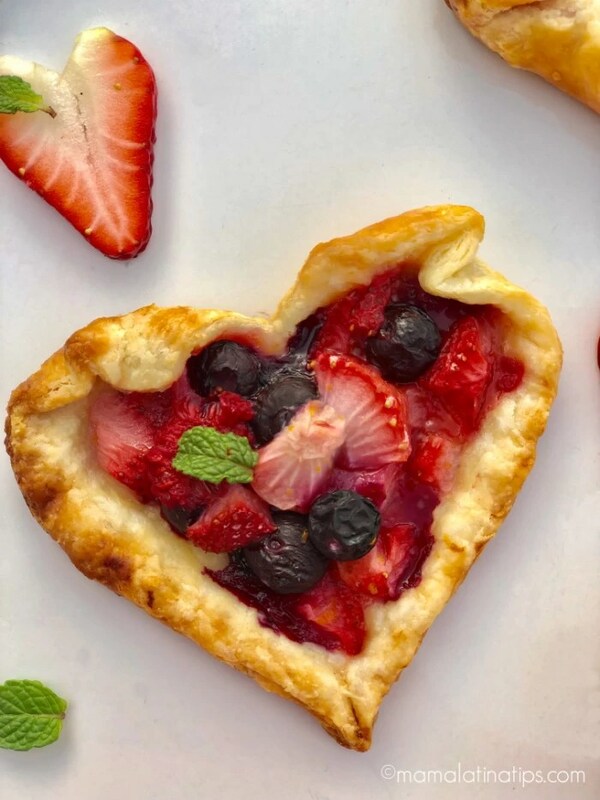 These heart shaped, Orange Berry Rustic Tarts bring the sweetness of Valentine’s Day to life. Colorful, light to the touch, crisp to the ear, and sweet to the tongue, their baked goodness fills the home with sweet, fruity fragrance and the warmth of crackling pastry. They’re like baked love, satisfying all the senses at once. Valentine’s Day, famous both for sweets and whispering sweet nothings, begs for just the right amount of sweetness. The sweetness in these tarts comes from the berries, the orange, and the Truvía Spoonable, with natural sweetness from stevia leaf extract. Stevia leaf extract comes from the sweet leaves of the stevia plant. So you get all the sweetness you want, but with less sugar – just ¾ teaspoons of Truvia Natural Sweetener equals the sweetness of 2 teaspoons of sugar. I like these rustic tarts. They are easy to make and don’t need to look perfect, because, well, they’re rustic. You can use a cookie mold if you like, but for these beauties you really just need your hands to fold the dough towards the center a little in order to hug the fruit. You want your dough flaky and buttery. If you don’t have time to make it, go ahead and use store bought pie dough. But if you have more time, I really recommend making your own dough. It’s easier to make than you think, the secret is keeping your ingredients, especially the butter, cold. If you have a food processor, great, you’ll have dough in minutes. If not, you’ll just need a pastry cutter or a couple of forks to mix the flour with the butter. 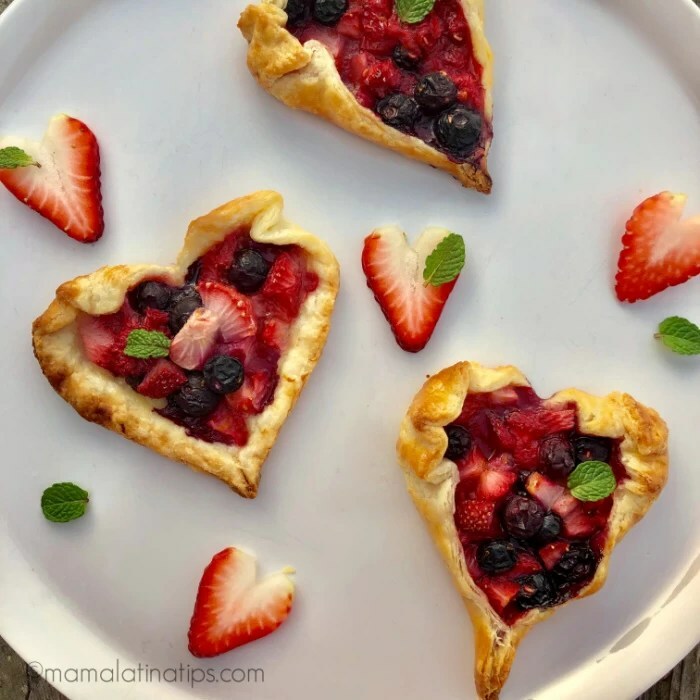 If you make these heart shaped orange berry rustic tarts, be sure to snap a photo and share it with us on social media using the #mamalatinatips hashtag. I’d love to see it and have a chance to share it as well. Or you can get store bought pie dough. Place flour, Truvía Spoonable and salt in the food processor, give 2-3 pulses to mix. Add half the butter and pulse approx 10 times. Add the other half of the butter and pulse until the mixture looks like rough sand. Pour in half the water, pulse 3-4 times. Add the rest of the water and pulse 3-4 times more. The mixture should look barely wet, still sandy but when you take some in your hand and squeeze it should hold its shape. Form a couple of balls with the pastry (please don’t overwork it) and cover with plastic wrap. Take the rolling pin and roll the pastry (in the plastic) to flatten. Refrigerate for at least 1 hour (making the dough in advance is better and you will save time on the day you make them). 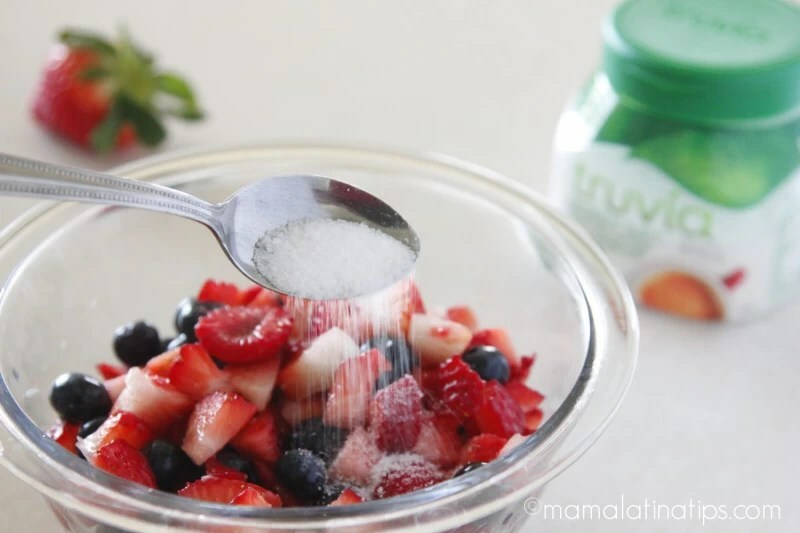 Mix fruit with Truvía Spoonable, taste for sweetness and adjust if needed. Add corn starch and orange zest. Cover and refrigerate. Take the dough out of the fridge and let it rest at room temperature for 10 minutes. Pre-heat oven at 400 degrees F (approx 200 degrees C). Flour your work space and rolling pin. Roll the dough out until thin. Cut the hearts using the stencil or a cookie mold. Place the heart shaped dough on baking sheets lined with parchment paper. 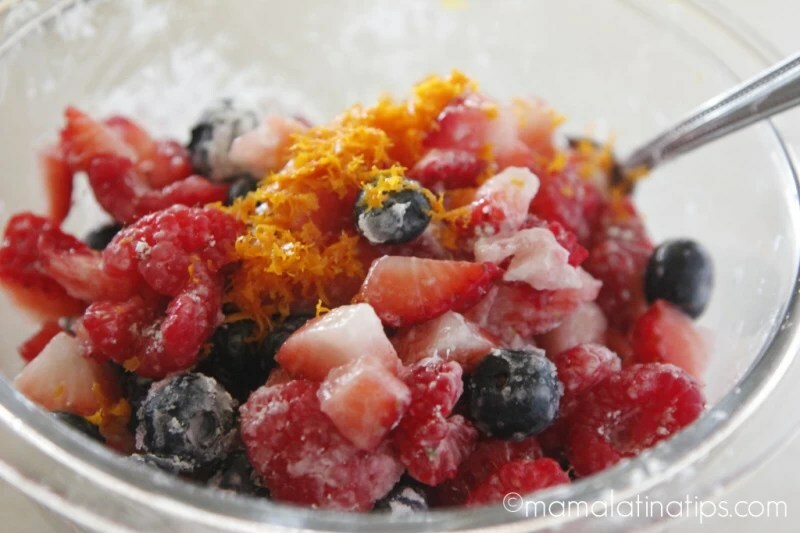 Place 2 tablespoons of the fruit mix in the center of each heart. With your fingers, pinch the dough at the bottom of each heart together. Then, gently fold the dough at the top of the heart to create a heart shape (See photos). It’s ok if it is imperfect. In a small bowl, beat the egg just enough to make the yolk and white combined and become homogenous. With a kitchen brush, lightly brush the egg wash on top of each pastry. This will give it a shiny, golden color when baked. Bake for 18-20 minutes or until the crust is golden brown. Take the dough out the fridge and let it rest at room temperature for 10 minutes. Pre-heat oven at 400 degrees F (approx 200 degrees C). Flour your working space and rolling pin. 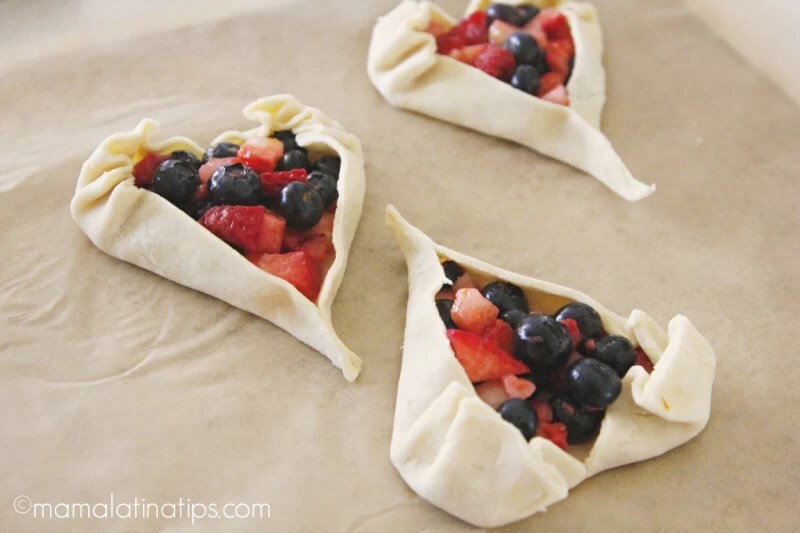 These tarts are so sweet – what a clever idea to have them heart shaped. This will make a lovely treat for Valentine’s Day. This berry tart sounds so yummy! I’ll have to slightly modify the recipe to make it gluten-free but I bet its going to taste just as yummy! It’s so easy to modify with a gluten free dough. Enjoy! Absolutely adorable. Romantic and with that pinch of orange that makes them really tasty! Yummy! These look adorable, I love that you used truvia since I am trying to avoid sugar in my diet. Also I like how dainty they are would definitely have more than one. I just love these! I’ll be making them for sure. I love tarts like this. Yum! That is really perfect for this upcoming Valentines Day. That Heart Shaped Orange Berry Rustic Tarts looks really delectable and yummy. Now, this sounds absolutely amazing, I bet it is a lovely mix of sweet and the crisp of the tart. If only I could try one right now. These look so great! What a super cute Valentine’s Day Treat! These tarts are the cutest and they look soooo delicious! I will try the recipe, i am so excited. Wow! I have never seen anything like this. I’ll definitely have to try this recipe, so unique and so much fun!! I know right! I haven’t seen many heart shaped rustic tarts out there like these. Thank you for stopping by. Those tartlets are so pretty and such a great idea! i would have never thought of doing the crust like that! These look so incredibly well prepared. I mean they are so pretty, I’d have trouble eating them! Love love love it!! So unique! These are so pretty. I need to make these for dessert tonight. This is such a cute and tasty way to celebrate Valentine’s, love it! These are adorable. I bet they are yummy. I’m all about fruit tarts! If those tarts taste as good as they look, they must be amazing! What a perfect treat for Valentine’s Day. Perfect for valentine’s day! They’re so cute! Aren’t they? They really are cute and delicious! Thank you, they were truly delicious. How sweet!! I love how light and flaky these are. Yum! This recipe is so cute! Love the form and colors. This looks so creamy and dreamy. Thank you, they are really cute, aren’t they?